Since ancient times the human kind has raised the issue of collecting and storing any substance that deserved to be stored and then be re-used in small doses, or at least according to very specific schemes and needs. With technological progress then, especially since the industrial revolution, tanks have begun to play leading role, even strategic: think about underground diesel tanks during the war, fundamental to protect fuel from view and from the enemies, or those used then for water in dry and arid places. Not hard to see then, that with the evolution of needs and use they also increased them supply range, which now aim to cover every industrial or civil needs in various price ranges. A tank, is therefore a container with the task of storing and preserving substances which may be solid, liquid or even gaseous, allowing to keep them under the right conditions, and if necessary to transport them elsewhere. SMEA Engineering, for decades designed industrial tanks of each type, especially in the industrial field, with the aim to provide the customer with a customized solution able to satisfy the most varied requirements. When requesting a design of an industrial tanks, it is good to bear in mind the use to which it is intended, and further defining a set of parameters; primarily you need the container size, which usually is indicates in liters or cubic meters, and then you try to define the space and weight. If you are talking about a tank for LPG, or otherwise intended to contain liquid or gas, then it will be crucial to have an idea of the pressure that is required to control and avoid risks of explosion or collapse of the structure. 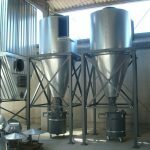 If finally it will be foods to be introduced into tanks, then it will be necessary to arrange the devices to ensure the correct thermal and solar protection. Substances forfeited in the container can be transported by truck through tankers, or by ship through large tanks positioned on container ships, which clearly can only travel to and from ports equipped to receive them and to manage the load. Remaining more in industry, which is served by SMEA Engineering, the tanks are mostly fixed or buried, and can contain any kind of substance: for this reason you have to design the realization by carefully choosing appropriate shape and materials in relation to the content; usually you choose to use silos for all hazardous substances, or for perishable or easily dispersible materials. The design must also take into account the stresses applied to the structure by materials weight, thermal expansion and atmospheric aggression. The internal pressures can be radial if it is imprinted by a gas, and in this case requires a spherical tank shape, otherwise if the content is liquid you will usually opt for a cylindrical shape with different reinforcement levels increasing proceeding downward. Is then good to keep under control the life of the plant with specialized techniques views and specific tests, in order to avoid damages and micro-cracks, since this would jeopardize the reliability of the entire plant. You finally provides for the removal and replacement of the tank when it becomes obsolete, or if the repair costs exceed the replacement ones. Finally, others accessories can be applied to customize the unit to its specific goals. Finally, it should be leveled the covering material in order to bring it in line with the surrounding soil. The result is a high performance and low visual impact container, good for all those times where you can not or do not want to opt for an outdoor installation.